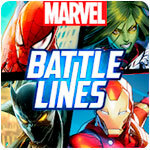 Marvel Battle Lines - Download and Play Free on iOS and Android! There are plenty of collectible card games out there for mobile devices, but only this one features all of the Marvel heroes and villains you've come to know and love. With more than 100 heroes and villains already in the mix, you're sure to be able to collect the ones you like most. Plus each one can be leveled up to become even more powerful. 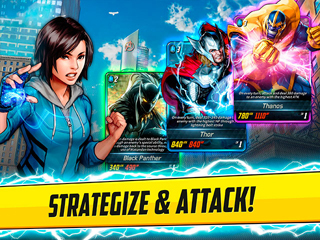 Written by an actual Marvel Comics writer, the story that plays out in Marvel Battle Lines takes players all across the Marvel Universe and even plunges them into the action against a variety of fearsome foes. Battle your way through both a story-driven single-player campaign and multiple PvP modes. Each one will give you a chance to earn more cards to improve your deck. 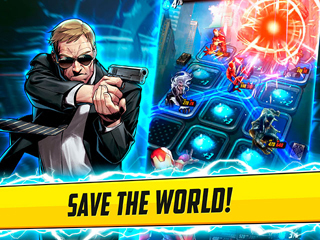 There are already mobile games based on Marvel Comics characters for just about every genre out there on mobile. So what's left? Nexon believes that a collectible card game might fill an unexplored niche, and given the popularity of mobile card games in general, that seems like a pretty decent bet. Marvel Battle Lines offers many of the things you might expect and a few that you probably don't to hopefully convince people this is something they've been missing. Let's start with the game's title, which wasn't chosen just for catchy marketing purposes. Instead of a Hearthstone-like setup with cards on opposing sides of a playing field, Marvel Battle Lines features a 3x4 grid upon which the cards are played. Positioning is crucial, as creating unbroken lines of your own cards (three across or diagonally, or four horizontally) sets off an attack that sends each character in that line off to attack the opposing player's avatar. Battle lines. Get it? To add to the strategic decisions players must make, the energy needed to play cards doesn't simply accumulate turn by turn, but rather appears in various locations on the playing board itself. That adds a needed bit of randomness to each match, along with forcing some interesting choices. Is it better to play a cheaper card and complete a battle line right away, or go for more resources on the board to improve your position later or deny an advantage to your opponent? While it's possible to earn avatars of various Marvel heroes and villains, each with their own abilities and stats, to serve as the centerpiece of a deck, the main character in the Campaign mode is someone you can find just by looking in the mirror. Yes, you actually get thrust right into a wide-ranging tale that takes place all around the Marvel Universe. It certainly feels like it would be a draw even for people who aren't the biggest fans of the card game aspect, and it's illustrated and presented in comic book-style panels and pages with some excellent art to boot. Naturally, Marvel Battle Lines isn't solely a single-player affair. Not only is there an Arena mode, where you can actually put your collected avatars and best cards to the test against other players in live PvP and move up the ranks for better rewards, there's also a Quick PvP Match mode that is exactly what it says. No ranking points are on the line, but it's a great way to just jump in and see if a newly constructed deck works the way you'd like it to, or just to compete without any serious stakes. For more solo fun, the devs also added a Special Ops mode, where you have to win battles and meet certain conditions, and a Trials Simulation section that resets daily and challenges you to conquer a series of five increasingly difficult AI decks. It's hard to imagine running completely out of things to do if you find yourself playing this game often. Acquiring more cards is certainly at the heart of many titles in the CCG genre, and this one is no exception. You level up cards by gathering more copies and then paying gold, the basic currency to boost their stats. It's a pretty simple and well-accepted gameplay loop. However, you can also earn additional cards by knocking out Campaign levels or by playing the other modes. The only problem is that each one has its own currency, which isn't uncommon these days but is kind of a lot to remember. On the plus side, it's not that hard to (slowly) earn premium currency to spend on card packs, and every other way to buy cards is at least gathered together for you in a single in-game shop. One of the nicest things about Marvel Battle Lines right out of the gate is that there are dozens of characters to collect, over 100 total at launch. The roster includes perennial favorites like Iron Man, Captain America and Thor, as well as plenty of more obscure sorts like Daimon Hellstrom (no, seriously). Alas, there are also quite a few cannon fodder-style generic cards of things like cops, dark elves and SHIELD and Hydra soldiers. Are these kinds of characters necessary for the full Marvel experience? You could definitely argue that they are, and the mechanics of the game allow for low cost cards to still be quite useful. That said, it's kind of a bummer to keep earning relatively expendable cards for much of the Campaign, even when they have their roles to play in battle. There's definitely a lot to like about Marvel Battle Lines, and fans of the source material will be extra psyched to at least check it out. The board is a different twist to card games and definitely adds a lot of intrigue to each battle, but it might also be too different for some mobile gamers who have gotten used to having this genre presented in very specific ways for so long now. The art and presentation are excellent as well, though that's also true of several other Marvel games for phones and tablets and isn't likely to help this one stand out. Despite the fun solo content, this is one game that figures to fly or crash based on how many other loyal players come back to it daily, so if you try it and like it, you might want to get your friends in on it too to ensure it's around for the long haul.